Below is Pope Francis’ speech during yeterday’s Angelus in St. Peter’s Square (June 14, 2015) taken from zenit.org. He reminds us of the importance of GOD’S INITIATIVE IN THE GROWTH OF HIS KINGDOM BUT WE HAVE TO LET THE SEED OF GOD’S WORD GROW IN US. How? Dear friends, do we struggle daily to make our heart a fertile ground through humility so that the seed of God’s grace could grow in us? Do we spend at least a minute daily reading the Gospel so as to know Christ better, convinced that “nihil volitum, nisi cognitum (one cannot love that whom one doesn’t know),” as St. Augustine said? Fr. Rolly Arjonillo, priest of Opus Dei. Catholics striving for Holiness FB page. Hope you’ll like it and invite as well your Catholic friends to our page to help them in their Christian life. Feel free share our posts. Today’s Gospel is composed of two very brief parables: that of the seed that sprouts and grows on its own, and that of the mustard seed (cfr Mc 4, 26-34). Through these images taken from the rural world, JESUS PRESENTS THE EFFICACY OF THE WORD OF GOD AND THE REQUIREMENTS OF HIS KINGDOM, SHOWING THE REASONS FOR OUR HOPE AND OUR COMMITMENT IN HISTORY. THIS WORD, IF RECEIVED, CERTAINLY BRINGS FORTH ITS FRUITS BECAUSE GOD HIMSELF MAKES IT SPROUT AND MATURE THROUGH WAYS THAT WE CAN’T ALWAYS VERIFY AND IN A WAY THAT WE DO NOT KNOW. (cfr v. 27). All this tells us that IT IS ALWAYS GOD WHO MAKES HIS KINGDOM GROW. THAT IS WHY WE PRAY SO MUCH “THY KINGDOM COME”. IT IS HE WHO MAKES IT GROW. Man and his humble collaborator, who contemplates and rejoices in the divine creating action and waits patiently for the fruits. The Word of God makes it grow, it gives life. And here, I WOULD LIKE TO REMIND YOU AGAIN, THE IMPORTANCE OF HAVING A POCKET-SIZED GOSPEL, THE BIBLE. A SMALL GOSPEL IN YOUR PURSE, IN YOUR POCKET AND TO NOURISH YOURSELVES EVERYDAY WITH THIS LIVING WORD OF GOD, TO READ A PASSAGE FROM THE GOSPEL EVERYDAY, A PASSAGE FROM THE BIBLE. Please don’t ever forget this. BECAUSE THIS IS THE STRENGTH THAT MAKES THE LIFE OF THE KINGDOM OF GOD SPROUT IN US. 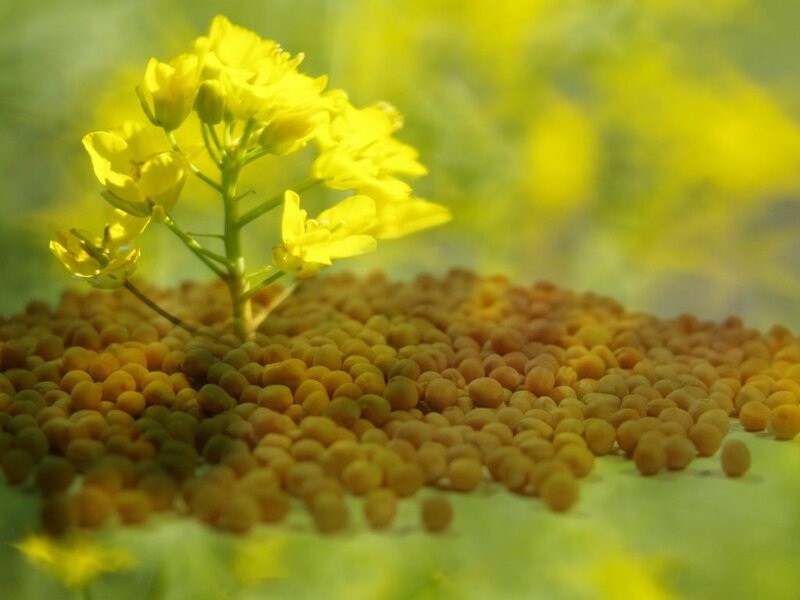 The second parable uses the image of the mustard seed. Despite being the smallest of all the seeds, it is full of life and grows until it becomes “the largest of plants” (Mk. 4, 32). And so is the Kingdom of God: a humanly small reality and apparently irrelevant. TO BECOME A PART OF IT, ONE MUST BE POOR OF HEART; NOT TRUSTING IN THEIR OWN ABILITIES, BUT IN THE POWER OF THE LOVE OF GOD; NOT ACTING TO BE IMPORTANT IN THE EYES OF THE WORLD, BUT PRECIOUS IN THE EYES OF GOD, WHO PREFERS THE SIMPLE AND THE HUMBLE. When we live like this, the strength of Christ bursts through us and transforms what is small and modest into a reality that leavens the entire mass of the world and of history. An important teaching comes from these two parables: THE KINGDOM OF GOD REQUIRES OUR COLLABORATION, BUT IT IS ABOVE ALL AN INITIATIVE AND GIFT OF THE LORD. OUR WEAK WORK, SEEMINGLY SMALL IN FRONT OF THE COMPLEXITY OF THE PROBLEMS OF THE WORLD, IF INCLUDED IN THAT OF GOD DOES NOT FEAR THE DIFFICULTIES. THE VICTORY OF THE LORD IS SECURE: HIS LOVE WILL SPROUT AND WILL GROW EVERY SEED OF GOODNESS PRESENT IN THE EARTH. This opens us to trust and hope, despite the tragedies, the injustices, the sufferings that we find. The seed of goodness and peace sprouts and develops, because the merciful love of God makes it mature. May the Holy Virgin, who received the seed of the divine Word as “fertile land”, sustain us in this hope. Today is the World Day of Blood Donors, millions of people who contribute, in a silent way, to help brethren in difficult. To all who donate, I express appreciation and especially invite the youth to follow their example. I greet all of you, dear Romans and pilgrims: parish groups, families and associations. In particular I greet the faithful who have come from Debrecen (Hungary), Malta, Houston (United States) and from Panama; as well as from Italy the faithful of Altamura, Angri, Treviso and Osimo. A special thought goes to to the community of Romanian Catholics who live in Rome and to the Confirmation youth of Cerea. I greet the group who remember all missing persons and assure my prayers. I am also close to all workers who defend the right to work with solidarity. 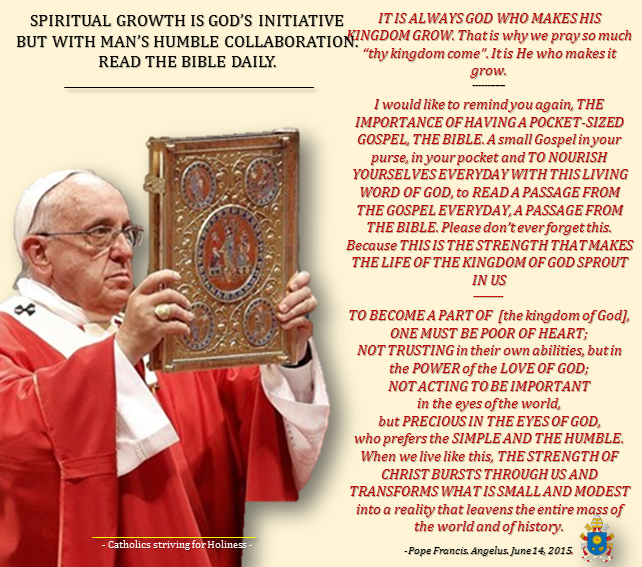 As it was announced, an Encyclical Letter on the care of creation will be published. I invite you to accompany this event with a renewed attention to the situation of environmental degradation, but also of recovery, in its territories. This Encyclical is addressed to all: let us pray so that all may receive its message and grow in the responsibility towards the common home that God has entrusted to all. To all I wish a Good Sunday. Please, do not forget to pray for me. Have a good lunch and goodbye! NEWS SOURCE: http://www.zenit.org/en/articles/angelus-on-the-parable-of-the-seed . CAPITALS MINE to facilitate reading..
Pope Francis holding the Bible: http://media02.radiovaticana.va/photo/2014/06/29/ANSA620627_Articolo.jpg (background removed). ME…HOLY? A YOUNG MAN ASKED ME…AND I ANSWERED: YES…! YOU TOO AS WELL! THE SECRET TO HOLINESS? LOVE!